This was all Knew of my great-great-grandfather when I started my search. 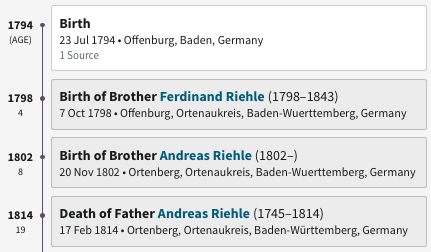 Since great-great-grandfather Anselem (Enzel) had died in the Civil War and his wife remarried and moved from the neighborhood where the Riehle’s lived, my father knew little of his grandfather’s family. From others working on this line I learned that they came from Offenburg in Baden. At the Mormon Genealogical Library at Salt lake City I found a Microfilm of the church records of Offenburg written in Latin. 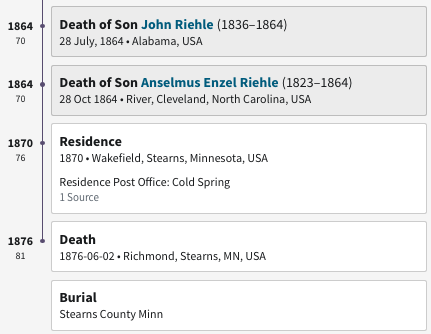 I found that Bartholomew Riehle was married on April 18, 1817 to Teresa Erb, daughter of Jacob Erb and Maria Spiringe. (This was difficult to read and may not be correct.) from Offenburg. 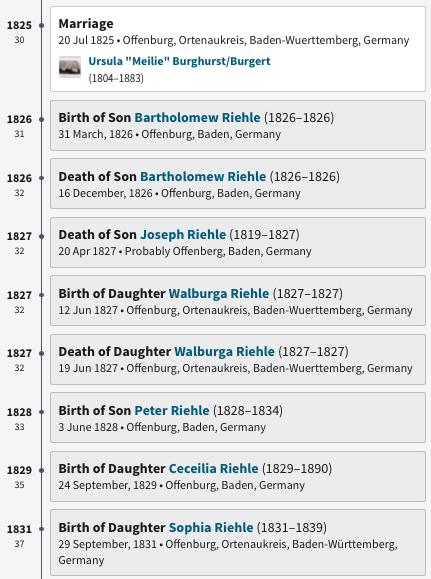 Bartholomew Riehle was the son of Andreas Riehle and Catherina Sufferly. Andreas was the son of Johannes Riehle, citizen of Offenburg, and Catrina Roul; he had been married first in 1777 to Magdlena Werner. He married a second time in 1784 to Catherina Sefferle, daughter of Jonnes Sefferle, citizen of Offenburg and his deceased wife Catherina Herp. Much more could be learned from a careful study of these records. To become a citizen of a town in the 18th Century Germany, it was necessary to be of the middle class, a farmer, merchant or tradesman, make application to the city fathers and prove that you were legitimate and not a Jew, and pay a fee. Citizenship gave a man certain privileges. This was a time of political unrest – the end of the feudal period when there were over a thousand little dukedoms each with it’s own government. It was the beginning of the consolidation of these many small states into the “Holy Roman Empire of the German Nations” or the first Reich. Bartholomew was educated at a time when an education was not available to all children. He brought with him to America a small hand written book which he had written in 1810, probably as a school requirement, entitled a “A short Biography of the Lord Jesus and his mother and his mothers parents.2 It gives interesting insight into the beliefs and teachings of the times. He later used the blank pages of the book to record the births, baptisms and deaths of his children. And I imagine he often used to read to the story of the Christ child that he had written as a boy of sixteen. I recently received a translation of this book. From it, from early records of St. Francis Xavier Mission, Massieville, Ohio and from Ross county land, marriages and cemetery records, I have pieced together a chronological record of the Riehle family. For some of the children, Bartholomew gave baptismal dates, the godparents and bits of information about them. 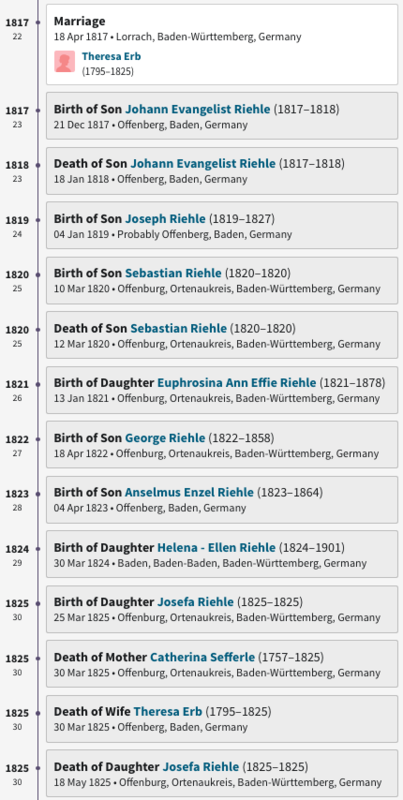 Bartholomew’s brother, Ferdinand Riehle, his wife Franziska Willinger, Franz Carl Stingler – The “Bronnenwirt”(Innkeeper of the Fountain Inn) and his wife Anna Maria Bahr were the only godparents mentioned for his children born in Germany. Of Bartholomew’s brother Ferdinand, apart from his wife’s name, (Franziska Willinger) we know nothing. If he had any children, we know nothing of them. The author of this Die Familie Riehle article, Margaret V. Dieringer (1916-2010), was the daughter of Forest Edger Moomaw (1884-1973), who was the son of Sarah E. Riehle (1851-1917), who was the daughter of Anselmus E. Riehle (1823-1864) who was the son of Bartholomew Riehle (1794-1876).